Since the age of 12, Wazhma Frogh has been conscious of gender inequality. Growing up in Afghanistan, in a home she shared with her immediate and extended family, When Frogh moved to Peshawar, Pakistan with her parents and sisters, she faced discrimination from her own father. A former army officer, he refused to pay for his daughters to go to school. Instead, Frogh began teaching the alphabet to the children of her family’s landlord. Using what money she made as a tutor, Frogh enrolled herself and her sisters in school. At the time, Frogh was in eighth grade. At 17, Frogh landed an internship at a prestigious Pakistani newspaper, Frontier Post. Believing the voices of Afghan refugees living in Pakistan were missing from the daily publication, she persuaded her editor to let her write an editorial about the conditions of refugee camps. Frogh spent seven days at a refugee camp, where men were selling the United Nations’ food rations while the women and children starved. Impressed by Frogh’s commentary, her editor asked her to write a weekly column on the camps’ conditions. One of the reasons Frogh was drawn to journalism was her belief that the media was inaccurately representing Afghan women as vulnerable. "Women are not passive. They are just not given a chance or the resources. They are portrayed poorly by the media," Frogh said. In 2003, Frogh traveled with a group of men and women around Afghanistan to hold provincial consultations, designed to garner feedback on the country’s new constitution. During one trip, the group was told that the backgrounds of the men in that province were too varied, and thus, the men would not come together. The group was also told that if the men could not find any common ground, the women would surely not rally together. Frogh decided to test the truth of this statement and she approached a group of women in a field. Though the women came from different tribal backgrounds, they were willing to talk. 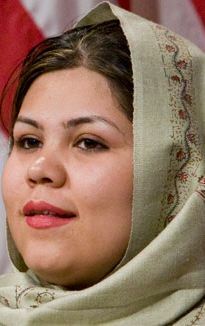 At 27, Frogh serves as the gender and development specialist for the Canadian International Development Agency in Kabul. In this role, Frogh helps maintain ongoing dialogue and networking on gender equality with government agencies, NGOs, activists, and research entities. She also works as a team leader for the Afghan Women's Network and as a consultant for civil society organizations addressing gender issues. Frogh was one of 25 international women who participated in The Initiative for Inclusive Security’s ninth annual colloquium in January 2008. During the two-week conference. She speaks Pashtu, Dari, Urdu and English. Office Address: Taimani, Street 9, Kabul.